That’s what I used to patina some of my copper pieces recently. I dipped the metal in vinegar and placed it on a little rack inside a plastic container. I then sprinkled the vinegar-damp pieces with large-crystal sea salt. A shallow layer of ammonia covers the bottom of the container. The rack allows the pieces to sit above the ammonia to be exposed to the fumes. The color started to show up within the first hour. I let the pieces sit for 24 hours. 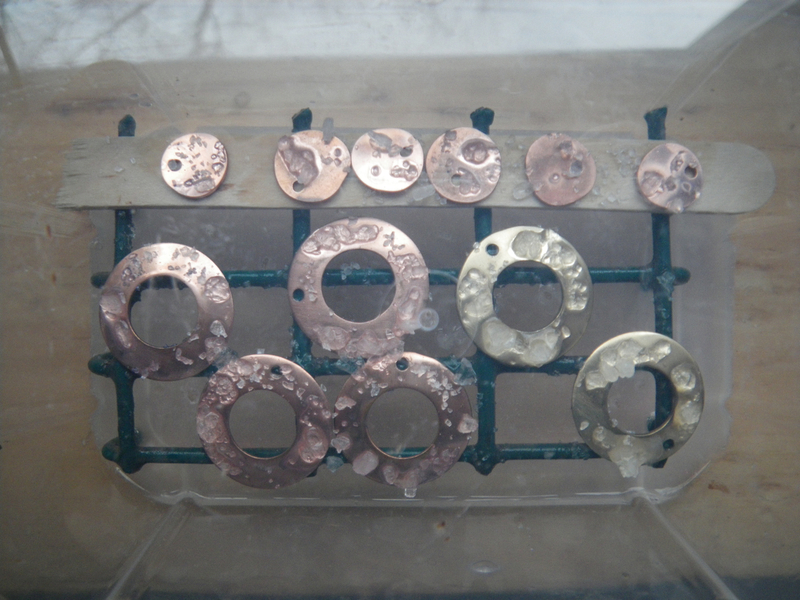 I took them out, rinsed off the salt and let them dry. I sprayed the pieces with lacquer, rubbed them with preservation wax and then started to use them in some new earring designs. In its final stage the patina ended up more green than blue. I love seeing my own patina’d pieces mixed with other metals, but it’s one of those techniques I often put off. It’s as though I don’t want to have to go through the extra waiting time to develop the patina, then seal it, then wax it. My procrastination only serves to delay my gratification further. Oy! I really am my own worst enemy. I’ll keep playing with patina just to get your comments! Barb – you do an awesome job. Last summer I was into this process in a big way but I placed my pieces on glass marbles in a container and they NEVER looked as neat as yours. Did you cut a piece of a lobster trap for the screen they are sitting on? You’ve got me all inspired to do this again. Thanks. You rock. I mean – you patina. Trish, you’re right. It’s wire from Bruce’s shop. The size of the holes is smaller than lobster trap wire. It was something he had lying around. I think it’s probably used for shrimp traps. Message me you address on FB and Bruce will send you a piece. Is your studio set up? Patinatize the world! Your work always amazes me. Oh, I really like your “in-process photos”. I have onky done this once, and yes it is time consuming..but your color results here are gorgeous! 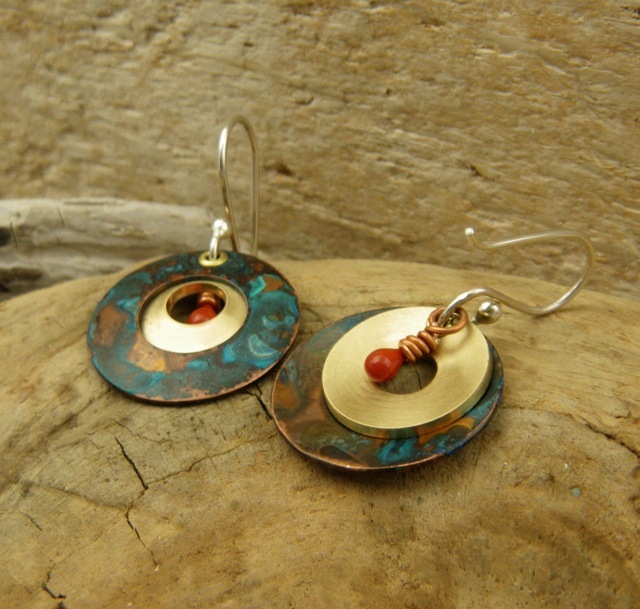 Your peek-a-boo earring designs are fabulous, too! Thanks Patti. I’ve used a lot of Shannon LeVart’s patinas, but would like to experiment more with my own, like this. Thank you for the great idea. I’ve been toying with crossing over into the world of metal but am a little reluctant to invest. But this is something that I already have on hand. *ideas swirling* This is great! Too bad they didn’t stay blue, though. That would have been even more cool. Hi Ginger. I think they might have stayed blue if I hadn’t rinsed them. It’s definitely worth experimenting with and without salt. I don’t know if its the combo of vinegar and ammonia that turns them more blue than green. Way better than eating potato chips and smelling cat pee, which is what came to mind when I read your title. These are gorgeous Barb! I love the layers and movement of these pieces. Barb, they look great! I tried this but did not let them sit long enough! I was frustrated…. thanks for showing that we have to let them sit waaaay longer than I thought!! !